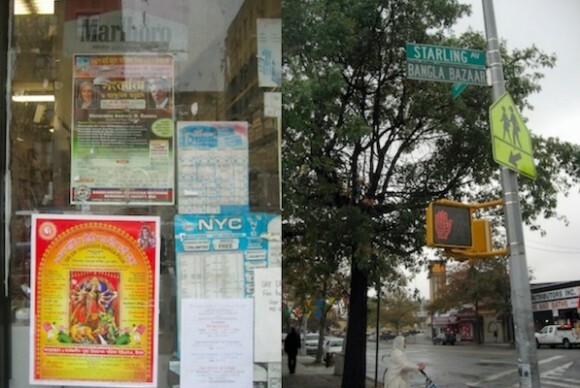 In Parkchester, where a major street was renamed in 2006 to reflect the area’s ethnic makeup, political signs appear in Bengali but the pre-election conversation revolved around the economy. Published in City Limits, Nov. 5, 2012. The Bangladeshi-American community in the Bronx leans heavily Democratic, but some voters who are concerned about jobs and the economy remain undecided about the presidential election. Mostafisur Prince Rahman, a registered Democrat since 1998, contributed $1,000 to Obama’s first campaign and even gave the president $100 for his birthday. This year, he’s unsure for the first time ever. Obama’s administration has tightened regulations in the housing industry, and Rahman, an independent mortgage broker, said those policies have hurt his business. Recently, he and his wife unsubscribed from all of Obama’s campaign communications. Sadeq Choudhury, who manages a Bengali restaurant in Parkchester, said he’s also most concerned about the economy. He voted for the first time in 2008, choosing Obama, but said he’s undecided this time around. He wants to know more specifics on what the candidates have in mind for the economy. About 3,600 Bangladeshi-Americans live in the Parkchester area of the Bronx according to the 2010 U.S. Census, but community leaders say the actual population is larger. For many new immigrants, the economy remains the primary issue for this election, said Mohammed N. Mujumder, president of the Bangladeshi-American Community Council, an organization that provides legal and educational services to Bangladeshi-Americans. “People in the immigrant community come from other parts of the world for a better life,” Mujumder said. “And they really care about jobs.” In a community that is predominantly Muslim, social issues are often secondary as people are concerned with meeting their basic needs, he said. According to a study released by the National Asian American Survey last month, 25 percent of South Asian voters were undecided in this year’s election. Despite the state of the economy, some Bangladeshi-Americans are optimistic about Obama and still plan to vote for him in November. Mohammed Miah, 39, said that he’s voting for Obama as he did in 2008 because he believes the president’s policies are better than Mitt Romney’s for the lower and middle classes. “He’s good for us,” said Miah. Others, like Juber Ahmed, 42, and Zuel Ahmed, 41, both taxi drivers, said they’re voting for Obama because they like his character. Some Bangladeshi-Americans who aren’t citizens are relying on their families to represent them. Said Rorofique, 50, works at Atul Grocery in Parkchester. Although he himself cannot vote, his son and brother-in-law will be voting for Obama, he said. Rorofique said the president needs more time to fix the situation that he inherited in 2008. This entry was posted on Friday, November 9th, 2012 at 3:09 am. It is filed under Print. You can follow any responses to this entry through the RSS 2.0 feed.